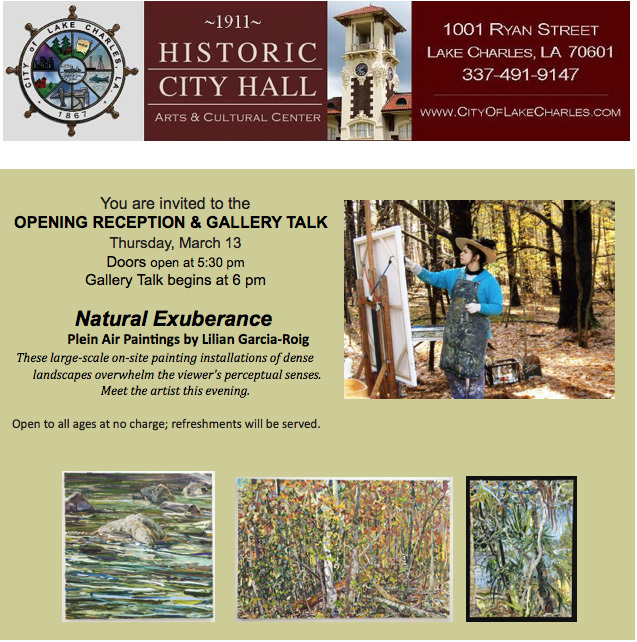 Department of Art | FSU Art Professor Lilian Garcia-Roig in "Natural Exuberance"
Home » News » FSU Art Professor Lilian Garcia-Roig in "Natural Exuberance"
FSU Art Professor Lilian Garcia-Roig in "Natural Exuberance"
Professor Garcia-Roig is opening a solo show titled ”Natural Exuberance” and giving a gallery talk at the Historic City Hall Arts and Culture Center in Lake Charles, LA on Thursday, March 13, 2014. Door open at 5:30 PM and the Gallery Talk begins at 6PM. Historic City Hall is located at 1001 Ryan Streetm LAke Charles, LA 70601. This even is open to all ages at no charge. Refreshments will be served.